There’s more to intellect and integrity than a diploma. John Leake, the son of John and Mary (Wright) Leake, was born on April 16, 1859 in High Bridge Row, Staffordshire, England. At the age of ten, after only four years of schooling, John went to work with his father in the coal mines of England. The extra income enabled the Leake family to immigrate to America. John and his parents, along with his three brothers David, Richard, and Frank, arrived in New York City on July 4, 1871. On that day, the Leake family celebrated their independence from Britain alongside the many citizens of the United States of America. They boarded a train in New York, and, after making several transfers, arrived safely in Cumberland. A C&P train took them to the Horse Shoe Bend Station in Clarysville, where a horse-drawn wagon hauled them up the mountain to their home in Pompey Smash (Vale Summit.) A new addition to the family, daughter Sarah, was born in their new home. John and his father found employment in the Astor Mine, mining the “Big Vein.” In 1874, John’s father was fatally injured under a massive fall of roof rock, leaving John, at the age of fifteen, to support a family of six. The Astor Mine closed three years later due to a raging coal fire which had been burning since 1862. John and two of his brothers were transferred to the Hoffman Mine. Local lore blamed the fire on an unattended campfire built by Federal soldiers guarding the mine during the Civil War. On April 4, 1883, John married Jane Hawthorne, daughter of Levi and Mary (McGibbons) Hawthorne. John and Jane established their home in Loartown, where they raised a large family. Annie, Frank, Steele, David, William, Thomas, Melvin, Idella, and Sadie were born between 1884 and 1899. All of John and Jane’s sons worked in the coal mines. 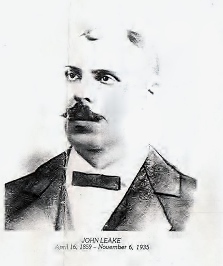 In 1896, while working as a miner, John Leake was elected as a Republican delegate to the Maryland General Assembly, where he served under Governor Lloyd Lowndes. He was re-elected in 1898, at which time he sponsored a bill proposing the establishment of State Normal School No. 2 in Frostburg. The bill failed. Delegate Leake persisted in his endeavor, and re-worded the bill to include “the people of Frostburg would furnish the ground for the site of said building, and deed it to the state.” To the surprise of many, the bill passed. Mr. Leake encouraged the miners and businessmen of the Georges Creek coal basin to donate what they could to purchase the land. They collected approximately 2,409 dollars; the cornerstone for Old Main was laid September 4, 1899. As the story goes, the rest is Frostburg State University history. During his time in the General Assembly, John Leake had not forgotten about the burning Astor Mine. He was able to demonstrate in detail how a brick wall archway could be built into the existing main heading of the mine. In 1916, the Consolidation Coal Company re-opened the mine by building a 2,500 foot-long concrete arch through the burning section, pumping water over it to cool the interior. Men and mules were able to move about safely. From 1918 until 1921, Consol No. 15, as it was now called, produced 14,654 tons of coal. The fire continued to burn in this mine until the 1970s when strip mining finally extinguished it. Mr. Leake worked for the Consolidation Coal Company for a total of 50 years. John Leake, a coal miner from humble beginnings with only a fourth grade education, used his intellect and integrity to improve the quality of life for residents of rural western Maryland. Our committee would like to thank Bernard Leake of Frostburg and Jane Hughes of LaVale for helping us with this recollection of their great grandfather. Segments of this recollection were chosen from “Biography of John Leake, Founder of State Normal School No. 2” by Anton Urbas.